This year there has been considerable controversy in the US over historical monuments, namely statues of heroes of the Confederacy. That came to the fore this summer in the white supremacists’ march in Charlottesville to protest the removal of a statue of Robert E. Lee. The debate over monuments has led to discussions on how to interpret the US Civil War with, for example, White House chief of staff John Kelly citing as the cause of the war an “unwillingness to com-promise,” not the maintenance of slavery. A similar debate has occurred recently in Germany. In this case, it is not about the removal of monuments, but rather the placement of a monument. 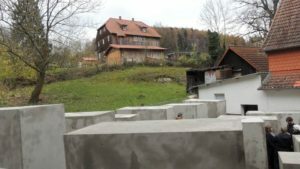 Last month, the local head of the right-wing political party, AFD, the Alternative for Germany, awoke one morning to find a new monument next door to his home. It was a smaller version of the Holocaust memorial in Berlin, a set of concrete slabs. The miniaturized monument was set up as a protest over politician Björn Höcke’s comments on German history, particularly the statement that Germans were “the only people in the world to plant a monument of shame in the heart of their capital,” referring to the Holocaust memorial in Berlin. This challenged the founding narrative of modern Germany, the acceptance of guilt for the crimes of Nazism. Höcke is the leader of the AfD branch in the central German state of Thuringia, a place rich in history, as remarked in a recent story in the NY Times: “The memorial has put an uncomfortable national spotlight on Bornhagen, a village of 309 inhabitants on the former border of East and West Germany in the fabled rolling hills of Thuringia, where the Brothers Grimm long ago collected fairy tales.” The situation is rich in ironies and contradictions, pointing to the complexities both of German history and recent German politics. Bornhagen has a connection to the greatness of German culture – not just the Grimm Brothers, but also Goethe visited the town. 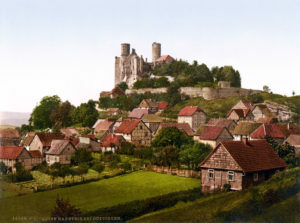 The major tourist attraction there (up until the new monument) has been Burg Hanstein, the ruins of a 13th-century fortress, a reminder of the old German empire. That is the setting for a popular Christmas market every year. As the fortress was almost on the border between the two Germanies, one of its towers was used by the East German border guard as a watch tower. Because of Höcke’s prominence as a spokesperson for the extreme nationalist wing of the AfD, Bornhagen is considered a very “brown” town, in German political symbolism, a color associated with neo-Nazis. In fact, in the federal election in 2017, the AfD captured 34% of the votes in the town. On the other hand, Bornhagen is home to 80 refugees from countries like Afghanistan, Iran and Iraq, a large number for such a small village. Reports indicate that the refugees have been treated well and some have found employment there. That discomfort is a feeling that has become familiar this year in the US, as a new President has upended many long-accepted views on a variety of issues, including US history.